It’s almost a little comical that whenever I put together little design mock ups, they’re not what my house is styled like (at all! ), but I spend my free time looking at homes on Redfin and Zillow just for fun and I envision how I’d decorate and/or renovate them. 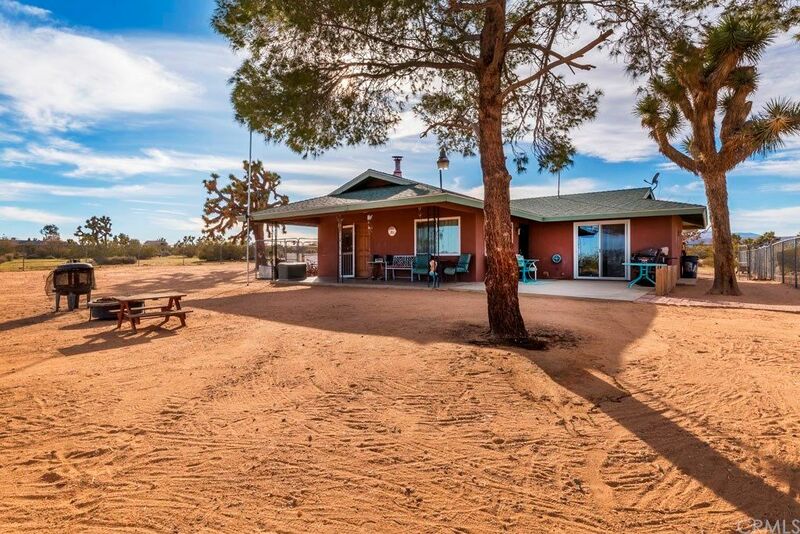 Sometimes I venture so far out I end up finding a house on the market in Yucca Valley that gives me all the heart eyes imagining a desert, bohemian, casual cozy abode. For this desert darling I’d paint the house a deep navy, create a large lounge area around the fire pit with some concrete stools and butterfly chairs and play up the indoor-outdoor living you can get away with in the desert! For the eating area, since the house under 1000 sq. feet, I’d do a fun simple little set. A moroccan print round rug in a gray and ivory, leather swoop chairs, tulip table, and some refurbished wooden shelves. You could argue it’s a little more on the masculine side with the leather chairs and metal base, but the light wood gives it a simple, natural look. A simple half dome lamp in either a black or a hammered brass would the perfect size overhead light for a small tulip table while still making a statement. And these chairs. Go ahead and order 4 because a) they’re under $100 for a set of 2 and b) they’re so cute that if you don’t want to keep all four at the table, you could use them in the living room or in the corners of the bedroom. P.S. 2.5 acres under $200k. This house is a little gem!! Going into staged homes can either be a blessing or a curse. Blessing because you can see what size furniture works (or doesn’t work) and curse because then that set up is stuck in your mind. I kept picturing the staged set up- which I thought worked really well- but I wanted to nail down pieces that were a good mix of feminine and masculine, traditional yet modern, and make a bit more of a punch since it was the first room you see as you walk into our home and sets the stage. The brick wall was like an obstacle that I had to get past. Don’t get me wrong, I love it, but I was having the hardest time figuring out what type and shade sofa that I wanted that would look good against the brick. J & I both liked the idea of a leather couch with a fun profile since this space is our more formal, conversational room (read no TV) but finding the leather sofa was difficult. I didn’t consider black leather until we came across this West Elm Modern Chesterfield sofa and we immediately knew the buttery soft, tufted leather in Licorice was exactly the punch that we were looking for! To brighten up the room, I opted for a pair of mid-century modern wingback chairs in a neutral twill, a black and gray overdyed rug, and brass accents throughout the room. I had everything in place for a couple weeks, minus a coffee table. I debated a few different coffee tables but ultimately decided on this CB2 one. A simple marble slab. At our old place our coffee table was always covered in things, trays, books, mail, etc. so I’m trying to keep the accessories to a minimum and let the white marble show off itself! I was overjoyed when I walked in during our house search to see so much of the original character maintained. The French doors and crystal door knobs make me smile every day! Although I don’t have a pink living space (yet) I love the way you can really freshen up a space with the all-the-rage shade in a very adult like way. The soft shades of pink have been on the interior decorating market for some time so it’s definitely a trend that’s going to stick around for awhile. When done right, it can act as a neutral or even the pop of color your neutral space needs! Millennial pink works so well with a cozy, bohemian style. In this mock up I’ve paired a pink slipper chair (super affordable) with a neutral couch and different patterns and materials to give the small space concept some depth and interest while not crowding. If you’re afraid to add in pink via your furniture, try adding in some decorative pieces like the globe, vases, or throw pillows. I totally should not be shopping for clothes right now after doing a major furniture purchasing spree, but I just can’t help myself when it comes to big seasonal changes like Fall. The rich colors, thicker fabrics, and opportunity to layer has me all sorts of excited. I’ve tried to buy strategic pieces 1. Because it’ll help keep my bank account at a whimper instead all out screaming at me and 2. I don’t have the closet space anymore so I need to purchase items that are classics and able to be mixed and matched. After many seasons of watching this J.Crew camel blazer, I finally pulled the trigger. I’m excited to style throughout the different seasons but especially for this Fall. I’m thinking jeans and white tee for the weekends and paired with these forest green pants & a blouse for work! I’ve been loving the newsboy cap trend right now. There are some super cute & affordable ones out there right now (like this ASOS one!) and if you’re unsure of the look, you can always give your baseball cap an upgrade with this cool one! P.S. This scarf is under $10 & comes in three different patterns! Home, Inspiration, Style, Washington D.C. While our almost 100 year old row home is in great condition, and it’s evident the previous owners really took care of it, there was one major thing that they did that completely bugs the heck out of me. (Even more so than the dated kitchen appliances!) They bought fans and light fixtures that are completely the wrong size – either entirely too big for the rooms, hanging down too low, or just plain ugly. I don’t know if it was what was on sale or if their taste is really that different than what mine is, but I knew switching out light fixtures and fans were a top priority! Since we just recently settled on and purchased a dining table, my search for a chandelier and wall sconces are in full force! (I can’t wait to get rid of the fan they put over the dining table. Talk about cold food!) Here’s the first “Save vs Splurge” post rounding up some really pretty chandeliers & pendants to hang over your dining table! It’s amazing that if you want a certain look for a certain price, it’s out there! Or if you want to splurge because you know it’ll just make the room – go for it! Either way, pick the one that you love because lighting really makes or breaks a room!